I think one of the hardest things about newsroom fashion is that often times it's very formulaic. No matter where you work, there is some level of expected professionalism. Many newsrooms have a dress code with very specific guidelines. Men generally have it easy - they wear a suit. For women it's a bit more complicated, and sometimes it can feel like your personal style is being suppressed. But I'm here to tell you that it is possible to express your unique style and stay within the constraints of your respective dress code. I bought this dress for an Associated Press awards luncheon two years ago. Then I got pregnant and couldn't wear it. It's a solid color so had I been on air the day I wore this, I would have been within the boundaries of my station's dress code, but the muted pattern of the lace makes the dress not boring. The finished touch are my shoes. They're the one detail that lets my personality shine without being overwhelming. This entire outfit, with the exception of my shoes, came out of the clearance section. I used to think I couldn't wear peplum, but then I tried on this shirt and realized how wrong I've been. It's hard to tell in the picture, but this shirt has a nice bit of texture to it. It's also a nice sturdy material. I've been trying to find more ways to wear it other than with this camel pencil skirt or jeans. 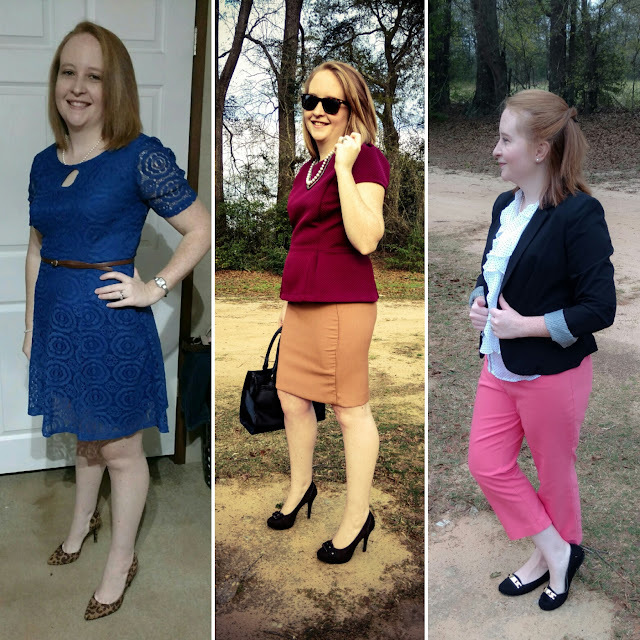 For me, peplum is the perfect silhouette -- it creates the impression that I have a waist even though mine is basically non-existent, and it perfectly hides what I like to refer to as my "mom tummy." 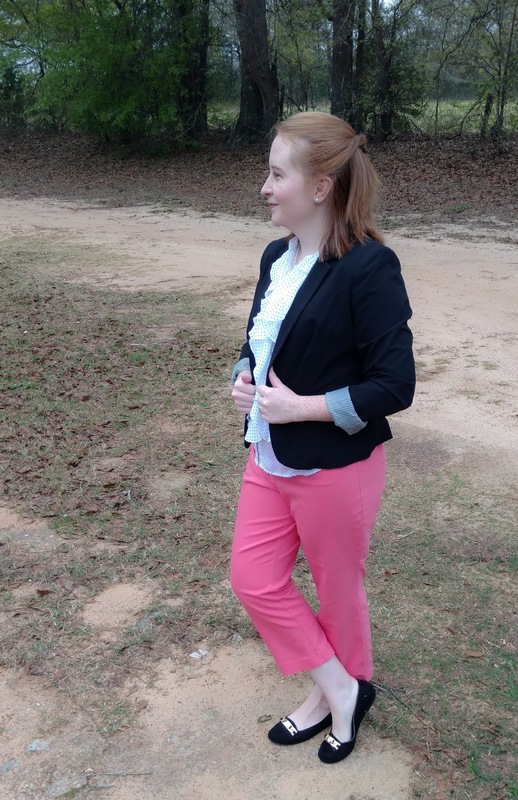 This outfit made me feel professional but still feminine. It also didn't hurt that when I stopped at a convenience store to get a drink that morning, the clerk told me I looked like I was going to take over a company. Every piece of this outfit is old. Part of the point of me starting this weekly series is to hopefully show you guys the importance of buying classic, quality pieces that will stand the test of time. These cropped pants (that fit me more like ankle pants because I'm short) will be in regular rotation all Spring and Summer. These black loafers are my go-to flats for when I want to feel polished but don't feel like wearing heels. This sleeveless polka dot blouse goes with more than half of my skirts and pants. And like I said in my Basics Every Female Journalist Needs post, a black blazer provides the perfect finishing touch.